This lovely place is really the jewel of Bathurst. The Victorian park features stunning gardens and historic landmarks - a bandstand, the Caretakers Cottage, Crago Fountain, Fernery, Lake Spencer and the Munro Drinking Fountain - all in the heart of the city. If you’re visiting the Bathurst region, it’s well worth the drive to visit the historic townships of Sofala and Hill End. These townships let you travel back in time and learn how our pioneers survived in the colonial days – some finding their fortune in gold. Top tip: Want to get some photos of the area? Beaufoy Merlin lookout offers spectacular views and an excellent vantage point. Want some real country hospitality? This is a long established coffee shop and cafe located in George Street opposite beautiful Machattie Park. Great coffee, quality homely meals and friendly service. This is a fantastic local boutique brewery in the historic Crago Mill building. They're experts at making crafted boutique beers, and alongside the brewery itself there’s a bar where you can try eight different beers matched with great food in a family friendly atmosphere. 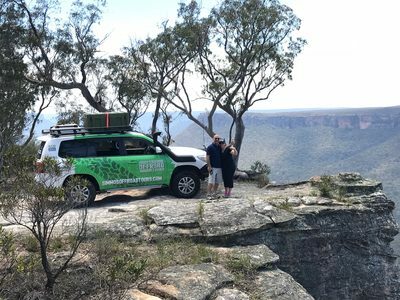 This experience offers you the chance to get off the highway and explore the rugged Bathurst region by 4WD with a knowledgeable local guide. Visit the historic townships of Hill End and Sofala, learn how to pan for gold or fish for trout and enjoy a BBQ lunch by the tranquil Turon River.